What Types of Allergy Test Are Available? Allergy testing measures how a person reacts to specific allergens, such as tree pollen, pet dander, foods, medications or molds. A "positive" allergy test means that a person has a specific allergic antibody to the substance tested. This often means that the person is allergic to the substance, meaning that the person will experience symptoms when exposed to the allergen. However, a positive allergy test does not necessarily mean that the person is indeed allergic to the substance. A person may have a positive allergy test to dog dander, for example, but experience no symptoms with exposure to dogs. In addition, a person may have multiple positive food allergy tests, but be able to eat these foods without any bad reactions. Therefore, an allergist is needed to perform and interpret allergy tests based on the person’s symptoms. 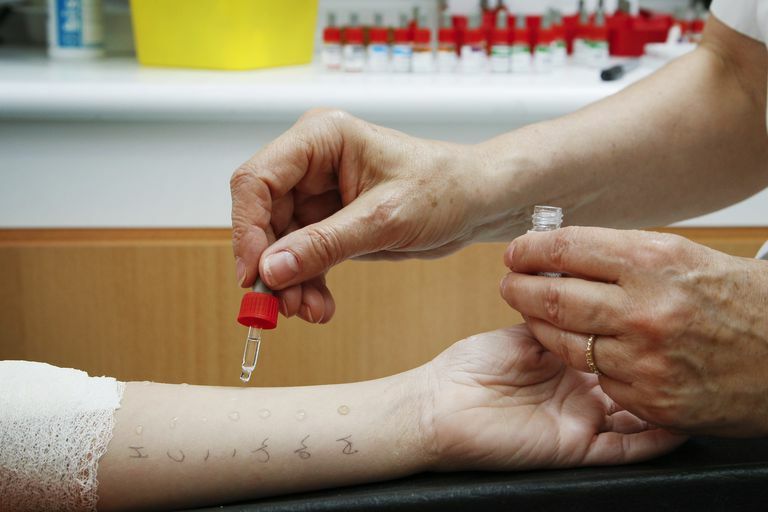 There are only two types of allergy testing considered to be valid: Skin testing (prick/puncture and intradermal) and RAST (radioallergosorbent test). Other tests for allergies may be performed in research settings (such as placing small amounts of allergen in the eye, nose or lungs to measure an allergic response), but are not helpful for everyday use. Patch testing is not used to test for allergy, but for contact dermatitis to various chemicals, which is caused by another part of the immune system. Numerous other tests are performed by non-allergy practitioners or people who call themselves “allergists” but lack formal training and national board certification in the field of allergy and immunology. Learn more about which tests to avoid in the diagnosis of allergies. Always see a formally-trained, board-certified or board eligible allergist when having allergy treatments. Skin testing is the oldest and most reliable form of allergy testing. This form of testing has been performed for 100 years and continues to be the testing of choice for the diagnosis of allergic disease. Testing begins with a prick, puncture or scratch method, which involves the placing a drop of the allergen in question (usually a commercially available extract of pollens, molds, foods, pet dander, etc) on the skin and abrading the skin with a needle. This testing is not painful, and generally, there is no bleeding involved since the needle only scratches the surface of the skin. After the skin is scratched, the tests take about 15 minutes to develop. There may be many skin tests performed, depending on the person’s age, symptoms and other factors. A positive skin test appears as a raised, red itchy bump, similar to a mosquito bite. The test is compared to the positive and negative controls, which are 2 other skin tests placed along with the allergens to be tested. The positive control is usually histamine, which will cause a raised, itchy bump in anyone who is not taking an antihistamine medication, such as Benadryl. It is not possible to be allergic to histamine, as this chemical is present in the body. A positive histamine skin test means that any skin tests performed at that same time with a negative result are in fact, truly negative (and that the negative result was not just due to the person taking an antihistamine, for example). The negative control is usually a salt water, or saline, substance. The purpose of this test is to ensure that a person does not have an irritant effect from the pricking of the needle. A negative skin test result to the negative control ensures that the positive skin test results are not due to an irritant effect from a person with very sensitive skin. If the prick skin test results are negative to various allergens, but a person’s history of allergies suggest that these results should be positive, then another test, called an intradermal skin test, can be performed. Intradermal skin testing, which involves the injection of a diluted allergen extract under the top layer of the skin with a needle, may be able to diagnose more people with the allergic disease than with the prick test alone. Unfortunately, intradermal skin tests may cause false positive results, and these tests cannot be used in testing for food allergies. A skin test represents allergic disease in miniature. It is a useful tool for people to see (and feel) their positive skin test to cat dander, for example, to truly understand that they are allergic to cats. This educational experience is much more dramatic than handing a person a report of a positive cat allergy test performed using a blood test. How is Allergy Testing Performed on a Blood Test? Radioallergosorbent testing (RAST) is an outdated form of allergy testing that involves measuring specific allergic antibodies from a blood sample. While RAST is still available, newer forms of blood testing for allergies involves the use of enzyme-linked immunosorbent assays (ELISA), which involves the binding of allergic antibodies in a blood sample to an allergen, which results in a color change when a developer is added. The darkness of this color change can be measured and translated into a concentration or amount of allergic antibody in the blood sample. While the quality of allergy blood testing has improved in recent years, it is still limited in the number of tests available, as well as the smaller amount of minor allergens present in a particular test (such as a certain pollen or pet dander). Allergy blood testing has recently become more useful in the diagnosis and management of food allergies, however. While skin testing to foods can give a sense, based on the size of the reaction, whether a person is truly allergic to the food, allergy blood testing actually measures the amount of allergic antibody to the food. This value can help determine is a child has possibly outgrown the food allergy, for example. The high cost of allergy blood testing, as opposed to the less expensive skin test, as well as the delay in results of days to weeks, also makes it less desirable than skin testing. Skin testing also continues to be the better test, with less false positive and false negative results. Skin testing is extremely safe, especially when performed by an allergist experienced in the diagnosis of allergies. Whole body allergic reactions, sometimes called anaphylaxis, are extremely rare from skin testing. However, given the possibility that anaphylaxis could occur as a result, skin testing should only be performed in a doctor’s office with equipment available to treat such reactions. Young children can also be safely skin tested, including infants. Typically, infants do take tests for food allergies, although they may have a pet or dust mite allergies as well. Children who are less than 2 years of age may have less skin reactivity to allergy skin tests. Since allergy blood testing involves testing for allergies on a person’s blood, there is no chance that the person will develop an allergic reaction as a result of the testing. However, the chance that a person will have a side effect from drawing blood, such as fainting, excessive bleeding, or infection, is actually higher than that of a side effect from allergy testing. Certain groups of people cannot have skin testing, and therefore allergy blood testing is a better test. These groups include those who cannot stop their antihistamine medications; those with sensitive skin (and a “reaction” to the negative control), those taking certain blood pressure medications (such as beta-blockers), and those with serious heart and lung conditions that put them at increased risk if anaphylaxis should occur. When Should a Person Have an Allergen Challenge? Challenging a person to an allergen means that the person is deliberately exposed to the substance, such as having the person eat a food to which an allergy is suspected. Food challenges are frequently performed to see if a child has outgrown a food allergy, or if a positive skin test actually represents an allergy. Food challenges are potentially very dangerous and should only be performed by allergy physicians experienced in their use. Challenging a person to a non-food allergen, such as pollen or pet dander, is not usually done in an office setting; however, these tests may be performed in academic or research settings. Want to keep learning? Watch how a skin test is performed.